Makes a great lunch. For a heartier dinner, serve with miso soup, a stir-fry or barbecued skewers of veggies and tofu, finishing off with fresh fruit. I haven't found the Ayurvedic qualities of sesame leaves, but find them dry and astringent, so I'll venture to guess that they increase Vata. 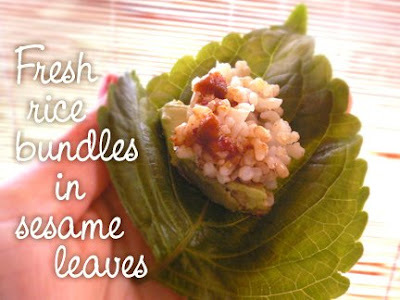 Love sesame leaves.Using lettuce leaves instead of sesame can able to give the same test? Sesame leaves as you know have a very unique flavour, kind of peppery, whereas lettuce is almost sweet and juicy, so the taste will be different but the little fillings are what really impart the most flavour! We do this a lot at home with various lettuces, brown rice, and a really good organic miso. Tempeh (lightly pan-fried to brown) makes agreat filling, too!